The following is a press release courtesy of Iowa State athletics communications. STILLWATER, Oklahoma – An incredible, record-filled performance by Kristin Scott guided No. 20 Iowa State (15-5, 5-3 Big 12) to a roller coaster 84-71 win over Oklahoma State (12-6, 3-4 Big 12) Saturday evening at Gallagher-Iba Arena. Scott finished with a career-high 31 points on a school-record 11-of-11 shooting from the field, which included 7-of-7 shooting from 3-point range, tied for the second-best single-game effort in school history. She did all that while also posting her third double-double of the season with 12 rebounds. Joining Scott with a double-double was Alexa Middleton, who had 15 points and a career-high tying 11 assists. 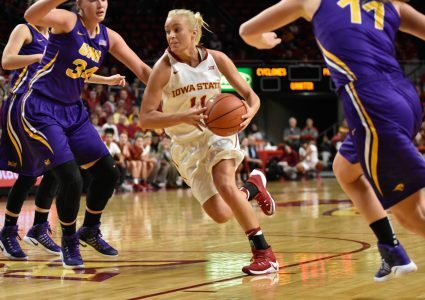 It was Middleton’s first double-double as a Cyclone and second of her collegiate career. Also scoring in double figures was Bridget Carleton (19) and Ashley Joens (15). The Cyclones totally dominated the first half, scoring the first 11 points of the game, racking up 32 first-quarter points and moving ahead by as many as 31 points. However, things went South for a portions of the second half, as OSU dominated the third quarter and got the ISU lead down to 10 points. However, the Cyclones were able to right the ship with a late 7-0 run to put some comfort back into the lead. Powered by three Kristin Scott 3-pointers, Iowa State stormed out to an 11-0 advantage in the first three minutes. Scott’s 13 first-quarter points on 5-of-5 shooting led an outstanding first period for the Cyclones, who held the Cowgirls to nine points. ISU went 12-of-15 from the field and 4-of-4 from the line to build up a 23-point first quarter advantage. The Cyclones would push their advantage to as many as 31 points in the first half. 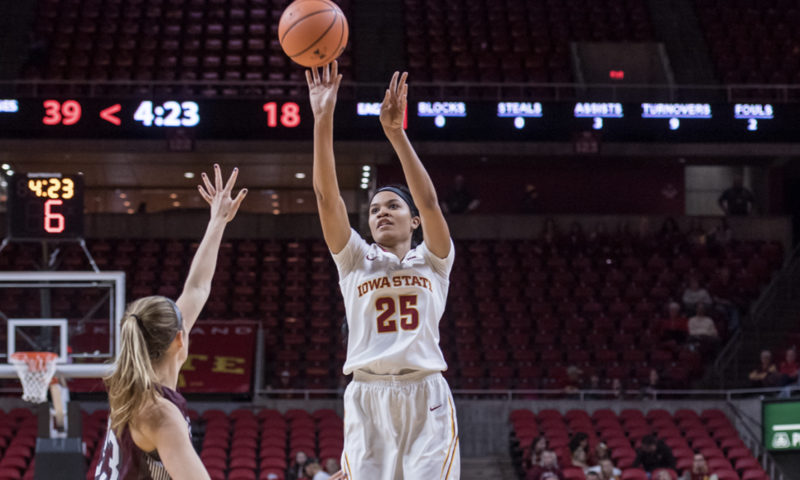 While the hot shooting start was cooled down by a 1-for-9 shooting run near the end of the first half, it was Scott again who put an exclamation point on the first with her fifth 3-pointer of the game as time expired in the first to give ISU a 47-20 advantage. Oklahoma State stormed out of the locker room to begin the third quarter, racking up 18 points in the first 5:30 of the quarter to 14 points at 52-38. 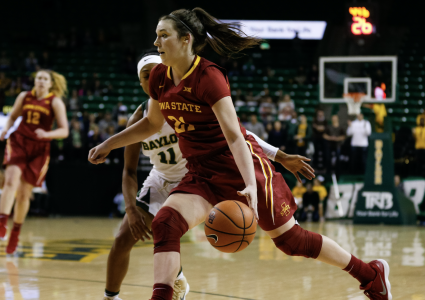 The Cyclones were able to stop the bleeding briefly, but OSU continued to push and rode a 64 percent third-quarter shooting effort to get within 11 at 59-48 with one quarter to play. Scott’s sixth 3-pointer on as many tries helped give ISU some breathing room as OSU continued to try and fight their way back into it. The Cowgirls cut it to 10 at 77-67, but ISU ripped off a quick 7-0 run with another Scott 3-pointer being the starter. From there, ISU was able to bring home its second-straight victory in Stillwater. There are many superlatives to be had for Kristin Scott‘s historic night. Her 31-point night came on 11-of-11 shooting from the field. That was the seventh 6-for-6 or better shooting performance in school history and Scott’s second in Big 12 play after going 7-of-7 at Kansas. From 3-point range, Scott’s 7-of-7 evening was the third 7-for-7 or better night in program history, the previous two both coming from Stacy Frese, including the school record of 8-for-8 against Nebraska in 1999. She did all that while notching her third double-double of the season, grabbing a game-high 12 rebounds. Iowa State returns to Hilton Coliseum on Tuesday to host Texas Tech. Tip between the Cyclone and the Lady Raiders will be at 6:30 p.m. with Cyclones.TV Powered by Mediacom televising the contest.